Pages tagged "community organizing in texas"
Regarding "Board president spares 3 schools from closure" (Page B1, March 6), the decision of the Houston Independent School Board to keep Port Houston Elementary open was critically important to the surrounding community. The closure of the school would not only force its children to attend a far distant school, but it also would have eliminated an institution which gives vitality, stability, a sense of confidence and well-being to the community. Leaders of EPISO and Border Interfaith leveraged enough City Council votes to restrict how much payday lenders can make off low-income families. Lobbyists flew in from Dallas and Austin to fight this ordinance, but this did not keep the council from heeding the organized voice of families and institutions, and voting 6-1 in support. Bishop Mark Seitz of the Catholic Diocese of El Paso supported these efforts to protect families from compounding debt and excessive fees. The new payday lending reform in El Paso allows lenders to loan no more than 20% of a borrower's gross income. Contracts must now be presented in the person's dominant language and short-term loans cannot be rolled over more than three times. With multi-colored packets in hand and plans for five subsequent enrollment workshops calendared, Dallas Area Interfaith leaders paused to welcome President Obama at Temple Emanu-El Wednesday evening. Obama thanked those gathered saying "there's no state that actually needs this more than Texas." Months prior to the Presidential visit, institutional leaders of Dallas Area Interfaith raised $20,000 to produce 100,000 copies of a multi-colored, bilingual booklet designed to educate uninsured residents about how the Affordable Care Act works. Civic academies, held in church sanctuaries and school cafeterias, have so far reached 1,600 North Texas residents, sometimes as many as 200 at a time. Leaders are learning that many people require basic education about how health insurance works with questions like "what is a deductible?" commonly raised. President Obama plans to meet with Dallas Area Interfaith at Temple Emanu-El, where hundreds of institutional leaders gathered last month to launch their institutional enrollment outreach strategy. 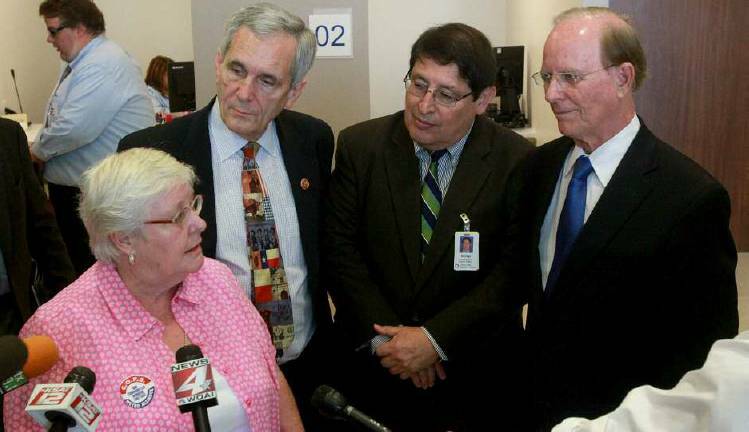 Chair of the DAI Healthcare Committee Gwen Lummus explained to the Dallas Morning News that "this area had the highest percentage of uninsured in the whole country. That's one of the reasons we've been working on this." 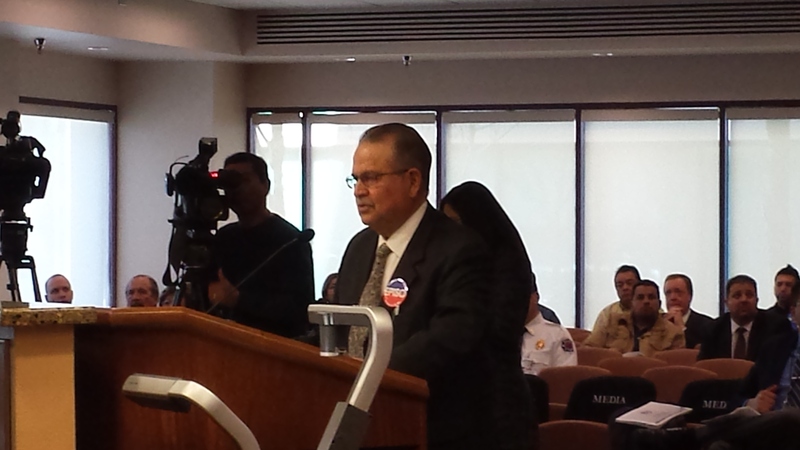 The Border Organization notified the Val Verde Commissioners Court that they plan to move ahead with efforts for groundwater conservation on the border, through the creation of a groundwater district that would regulate the amount of water sold to private corporations. Recent proposals by private corporations to pipe water from the border and into San Antonio spurred leaders like Sandra Fuentes into action. They plan to work with city council members and state legislators to address the lack of oversight. "Austin Interfaith worked from the ground up to get its priorities included in the budget....It represents the interests of low-income families and has become a familiar presence at City Hall in recent years. Austin Interfaith leaders mobilized members to show up en masse to city budget hearings to plug these programs, meet with council members and bombard council offices with calls and emails in the days leading up to the final budget vote. The nonprofit was elated that council members agreed to spend money on all of Austin Interfaith's priorities, totaling $2.4 million." With about 100,000 Bexar County residents eligible to get healthcare insurance through the exchange, leaders from COPS/Metro Alliance and University Health System brought together close to 100 community stakeholders to evaluate ACA implementation readiness and identify concerns. The first enrollment period for the subsidized insurance runs from Oct. 1, 2013 to March 31, 2014. Leaders aim to develop a comprehensive plan to educate San Antonio area residents on the Insurance Marketplace provision. Citing evidence that the regional return on investment for Project ARRIBA's workforce development is $26 for every $1 invested, the City Council of El Paso voted to increase funding to $1.5 Million over five years, rather than the $1.25 Million initially recommended by city staff. This is the single largest investment the city has made into ARRIBA since its inception. This funding will enable the project to support the training and placement of 600 El Pasoans into living wage careers in the border region. Organization leaders are hopeful that this will help leverage matching funds from the State of Texas through the Texas Innovative Adult Career Education (ACE) Grant Program.